Offering you a complete choice of products which include copper chromium zirconium. We offer: C18150,C18200 for spot welding. CuCr1Zr – UNS.C18150 Chromium Zirconium Copper C18150 is an excellent and unique copper alloy with high electrical conductivity, hardness, and ductility, moderate strength, and excellent resistance to softening at elevated temperatures. The addition of 0.1% zirconium (Zr) and 1.0% chromium (Cr) to copper results in a heat treatable alloy which may be solution treated and subsequently aged to produce these desirable properties. Rod is usually supplied from the mill in the fully aged and drawn condition so no further heat treatment is required by the fabricator. The softening temperature of properly heat treated C18150 rod exceeds 500°C as compared to unalloyed pure copper which softens at 200°C, and silver bearing coppers which soften at 350°C. 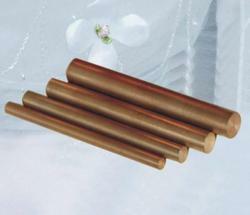 Looking for Chromium Zirconium Copper ?